I'd say it's been a long road, but for us kids it really hasn't been. From our perspective it all happened really fast, but for him I am sure it was a much longer journey than what any of us were let in on. Dad was not someone to over-communicate about things. When someone dies you naturally want to focus on the best parts of the person. It seems like the right thing to do. There are so many good parts to my dad, but there were a lot of complicated parts too. He came from a background he never talked much about. He moved around a lot as a kid, which I think solidified his desire to provide one, solid, steady home for his family. His father was not the nicest guy. We never heard all the particulars about that. 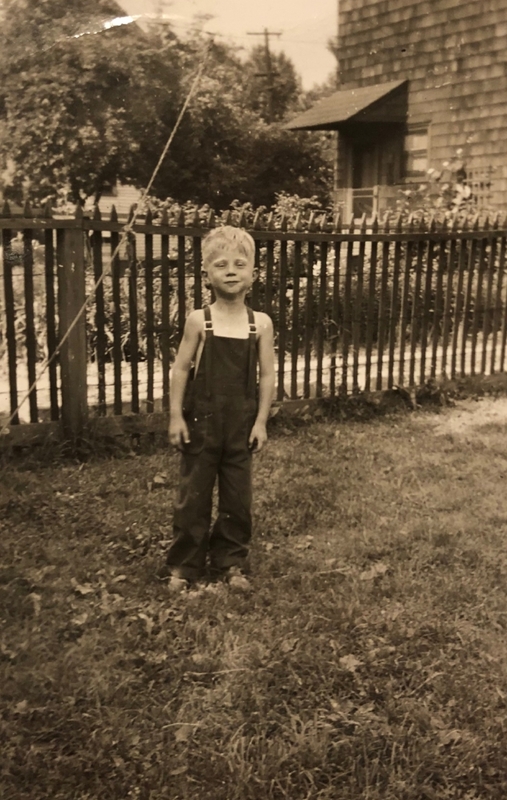 Dad spared us the details, but from the little we could gather it was pretty clear that his childhood was not all sunshine and roses. Somehow Dad pulled himself out of the chaos. He put himself through college. He worked and paid for it himself and it took him eight years of night school to get his degree. He met and married my mom and together they moved to a small town, raised 5 compassionate, thinking, humans, built the family home, supported the mother-in-law, and gave and gave and gave to their community. Dad was quiet, but he had a work ethic and he was a giver. When I think of him, I think of him endlessly working on our house and yard. I think of him changing his own oil and muffler. I remember him in his plaid work shirts mowing our enormous lawn with a push mower and having to lie down on the living room floor for a half an hour between the front and back lawns to rest. I think of him on a ladder outside my bedroom window early on a Saturday morning uttering profanities under his breath at the pieces of siding he would be working to replace. I can hear him bursting into my room on any given weekend morning and saying enthusiastically “Hey! You want a project?” before making me rake up all the wet leaves or pick up all the sticks from the ginormous yard. I remember him lugging sound equipment to every possible venue to record or provide sound engineering for church services, vocal performances, community events and every single orchestra concert I was ever in. I remember him turning on the 6:00 nightly news during dinner every night, and watching the 11:00 news in his PJs at the foot of his bed before going to sleep. When no one knew where he was, he’d more than likely be in his warm basement workshop working on wiring, or stamp collecting or paying bills or whatever other quiet projects he had that helped him escape the chaos of a 5 child household. Some of my favorite memories of Dad from the time after I left home were of the things he and Mom decided to do during their retirement. He sang with the local choral society. He performed with the community theater in their “Old Time Radio” shows. One time in college, my then boyfriend (now husband) and I drove overnight from Philadelphia because my mom let it slip that Dad was performing in the community theater production of Big River. He had exactly two lines in the first scene of the second act. But it was so fun to see Dad, coming out to do his two lines and knowing he’d just done that show because he felt like it. Afterward we went back home and had his favorite dessert before we headed back to the city: ice cream floats with cherry soda. As a kid, Dad took me to the YMCA Indian Princess meetings and to their camp one summer. He picked me up from dance classes (late many times because he had to stop at Sears to pick something up on the way). He donated many, many pints of blood and volunteered with the Lions Club for decades. When we visited home as adults he roped us into pancake breakfasts, spaghetti dinners, helping put new roofs on at the camp for the blind and generally just pitching in with whatever the Lions needed while we were in town. Dad. Worked. Hard. He worked hard at his job. He worked hard to keep a roof over our heads. He worked hard to make sure every one of us went to college. On the day Dad passed, my sister and I dropped everything and drove the 4 hours home to be with Mom. It was a strange day of getting the news, being there for Mom, figuring out what comes after death and collecting his things from his hospital room to take home and lay out on the bed. It’s weird after someone dies. There’s the shock and the quiet and the subsequent busy days of “making arrangements” that have to be made. There’s not very much time to process everything in the way you’d necessarily like to. For me, I kept looking for signs of Dad… in his things, in his hospital room, in the old house… and Dad was nowhere, but everywhere all at the same time. Every piece of everything in that old house is a piece of Dad. I think that word came to me because that was my dad. He was a complicated guy from a complicated background with complicated ways of communicating, but he was kind, well meaning and compassionate. He was someone who never shied away from taking care of the people he loved in the best ways he knew how (even if we didn’t always understand them), or from giving something to his community in any way he could. I want to leave you with a list of some things I learned from my Dad. Because when someone is no longer with you, it’s best to look for the lessons. It helps make a just little sense of the loss. Floats are always best with cherry soda. Green olives are the best olives. Even if you can’t play the Moonlight Sonata particularly well, it doesn’t mean you shouldn’t try. Thin mints are the only candy that’s really worth it. When overwhelm strikes, it’s good to have a warm, quiet corner of the basement to retreat to. Documenting everything runs in our bloodline. When your family wants to order out, it’s best to tell them every possible special deal and exactly what they should order off the menu. Having a working map in your head of every road east of the Mississippi comes in handy, especially when giving directions to someone who is just about to walk out the door. Then make sure to tell them the best places to eat on any trip they plan to take. When you wire all the outlets so that the top one on every socket in the room goes on and off with the light switch, it really messes your kids up when they go out into the world and suddenly realize NO WHERE ELSE in the world is wired that way. Total cereal is a healthy way to start every day (but it still tastes like eating cardboard). When the dogs get in a fight, remember to bring your towel with you when you run out of the shower to stop them. When the kids leave the bathroom light on one too many times, just wire the door so that the light goes off every time it opens. Installing an intercom system in your house is great in theory, but when no one can understand a damn thing that’s being said over it, you’ll probably still have to run around the house gathering everyone for dinner. Never forget to put the parking break on in the car when you live on a hill. When you forget, the car will most likely roll down the driveway, down the hill and into the ditch across the street. When the local prison has an escaped prisoner who fits your general description, it’s best not to work outside in your garden while the helicopters circle overhead. Right before you leave the house is always the BEST time to think of a last minute “quick project” that needs to happen right before you go. When someone has an injury, even a serious one, it’s best to “wash it off so we can have a look at it”. Unless the person passes out. Then it’s best to get them to the ER - ASAP. Giving cats and dogs really cute names like “Scrooch Pooch” and “Puss E. Cat” does nothing to stop them from “piddling” on the carpet. No matter how many times you quiz your kids on “which composer is this” with your classical tunes, chances are they aren’t ever going to get it right. Never watch a movie all the way through when you can sleep or pace the room instead. When you’re confused, the best thing to say in any situation is “What the Sam Hill is this?” or if you’re really under duress “What the Hell is this?” will do. Shorts are for the weak. Work hard, do your best and keep working. Build your home with love.